Afghanistan beat Ireland by five wickets in the first of five one-day internationals in India. 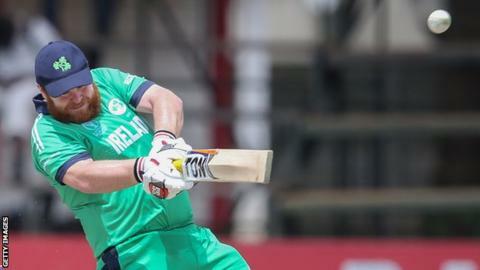 Paul Stirling's 89 helped Ireland to a modest 161 with Mujeeb Ur Rahman taking 3-14 in Dehradun. Gulbadin Naib hit 46 and opener Mohammed Shahzab 43 as Afghanistan won with 8.1 overs to spare despite Boyd Rankin's 2-48. Afghanistan whitewashed Ireland 3-0 in the Twenty20 series this month. Ireland never recovered from slipping to 14-3, although Stirling added 78 for the seventh wicket with George Dockrell, who made 37. But the loss of three wickets for one run ended their hopes of a competitive total and Stirling was the last man out with four balls remaining. Dawlat Zadran finished with 3-25 and Gulbadin took 2-20 before top-scoring with 46 in Afghanistan's chase. The second ODI takes place at the same venue on Saturday.